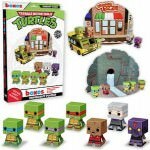 Are you a big Teenage Mutant Ninja Turtle Fan? Well, why sit is a normal chair when you can sit in this cool Teenage Mutant Ninja Turtle chair and watch all your favorite TMNT episodes. 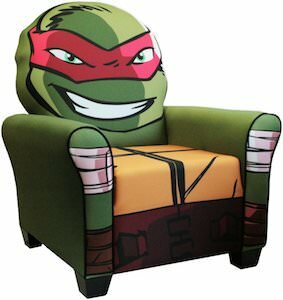 This unique Teenage Mutant Ninja Turtle Chair looks just like a ninja turtle wearing their bandana and a big grin on his face in the shape of a chair that comes in either Raphael, Donatello, or Michelangelo. It is 100% polyester cozy fabric and the comfy seat measures 20 inch by 21 inch in size. When you sit in the chair you will dream of going on adventures with the TMNT yourself. And this Teenage Mutant Ninja Turtles arm chair is not a kiddy chair it is made for adults but kids can sit in it to. Curl up now to read your favorite TMNT comics, watch a television show or movies in this big comfy Teenage Mutant Ninja Turtle Chair.